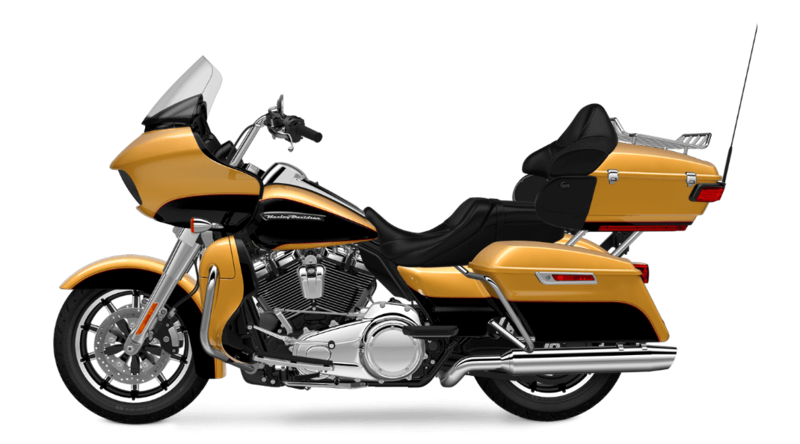 The Road Glide® Ultra, available now here at Rawhide Harley-Davidson®, is an iconic touring bike equipped with sophisticated features. It’s a stylish, upscale touring motorcycle that now offers more power than ever thanks to a new Milwaukee-EightTM V-Twin engine. Find out more about the Road Glide® Ultra and the rest of the Harley-Davidson® Touring lineup here at Rawhide Harley-Davidson®. 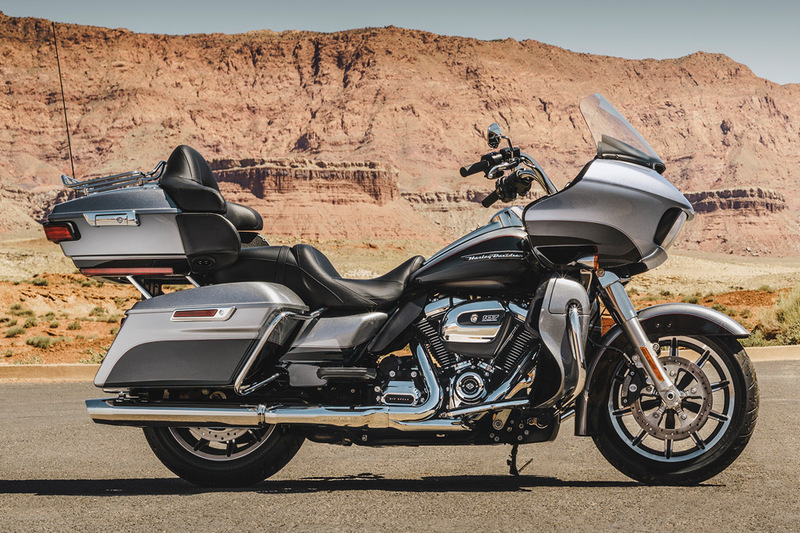 The Road Glide® Ultra is a loaded touring bike ready to hit the road for the longest rides thanks to the latest Harley-Davidson® features. All-New Milwaukee-EightTM 107: The new Milwaukee-EightTM offers the best of both worlds. It provides more power and more efficiency, and it’s paired with a better ride and cooler operation. 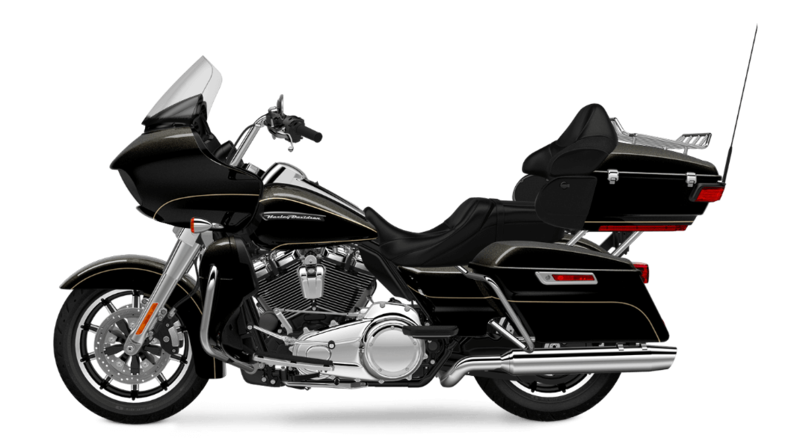 It also delivers the iconic good looks of an air-cooled V-Twin along with the exhaust note that you know and love. Milwaukee-EightTM Overview: The high tech Milwaukee-EightTM 107 provides more power and efficiency thanks to a high compression ratio, four valves, dual spark plugs, and a single chain driven cam. New cooling systems and counter-balancing provide a cooler, smoother ride for long-haul comfort. It even delivers better charging for all your accessories. All-New Suspension: With a redesigned easy-adjust suspension in the front and rear, it’s simple to set up your bike to deliver the kind of ride you want. The Road Glide® Ultra can handle whatever combination of passengers and luggage you need. Brembo® Brakes: You’ve got high performance stopping power thanks to two Brembo® brakes up front and one in the rear. 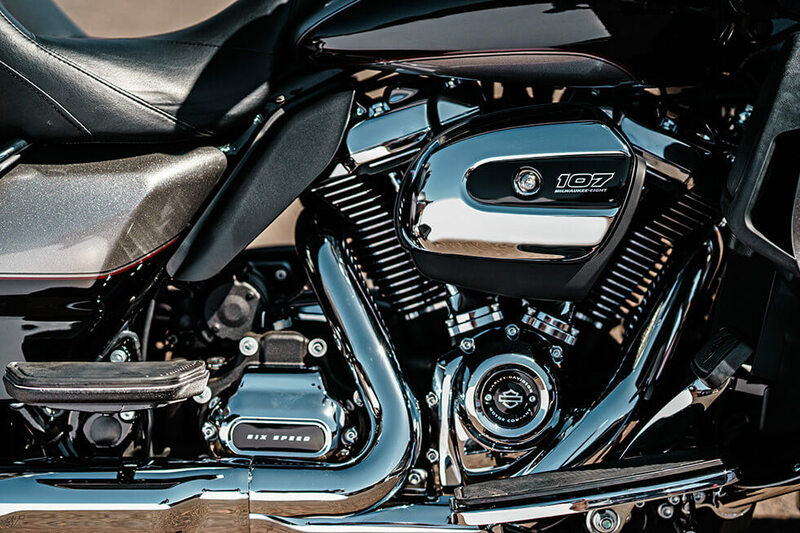 H-D® Smart Security System: This factory installed standard feature delivers the security you want thanks to a wireless keyfob that automatically activates the system when you step away. ReflexTM Linked Brakes with ABS: Anti-lock linked brakes deliver superior stopping power, and they practically eliminate wheel lockup even on slippery roads. Steering Head and Front Forks: The oversized front fork legs offer added stiffness and more confidence in the corners, while retuned dampers provide plenty of cushion. Dunlop® Multi-TreadTM Tires: These premium tires offer the durability you want on a touring bike thanks to a harder compound in the middle of the tire. Soft rubber on the edges supplies more cornering capability, making these the ideal tires for the Road Glide® Ultra. Ergonomic Hand Controls: Right there on the hand grips you’ve got access to features like infotainment, cruise control, turn signals, and everything else. Dual DaymakerTM Reflector Headlamps: These incredibly bright lights deliver the punch and spread that makes even the darkest roads a breeze to ride down. Six-Speed Cruise Drive® Transmission: Smooth shifts let you easily move through the gears up to speed. This gearbox also makes it easy to find a low RPM cruising gear. The Road Glide® Ultra provides the kind of high tech features you want to stay connected on the road. 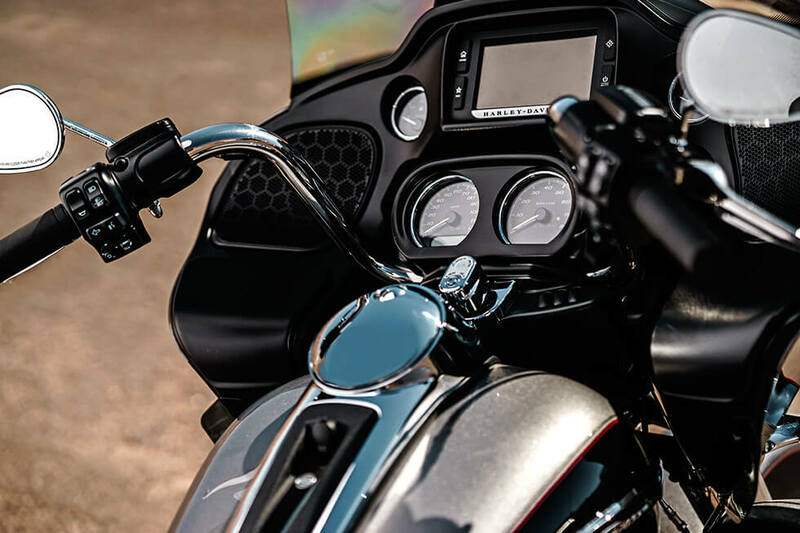 6.5-inch Touchscreen: This intuitive touchscreen interface gives you access to all the functions of your H-D® infotainment system. Boom!TM Box 6.5GT Radio: This radio cranks out big, bold, crystal clear sound, and even automatically adjusts volume and equalization depending on your speed. Jukebox with USB Port: Plug in your favorite smartphone or other devices to stream your audio and recharge the device. Handsfree Infotainment: With smart voice commands you can take advantage of your infotainment system while you focus on the road. 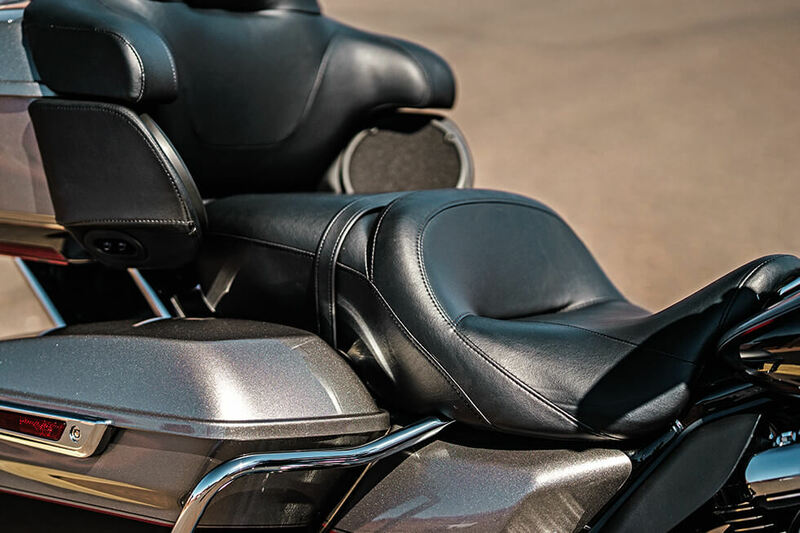 The Road Glide® Ultra was designed to deliver unbeatable comfort and a premium feel. Back and Arm Rests: To keep both passengers happy the back seat gets a back rest and arm rests. Fairing Lowers: Your legs get coverage from cold wind, and you even get vents that you can open to let air through. That’s something you’ll appreciate during the hot summers of in Overland Park, KS. Increased Passenger Seat and Leg Room: The rear seat passenger can relax with more space in back than ever, and this premium seat even offers more leg room. 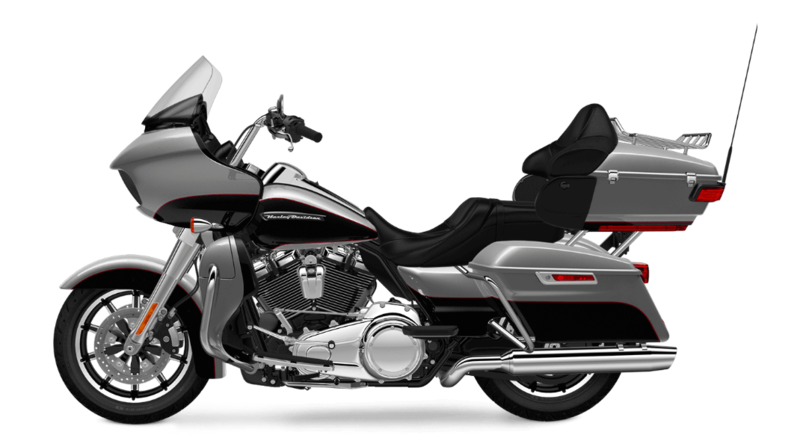 Fairing Design: Every curve and contour of the stylish fairing on the Road Glide® Ultra is aerodynamically designed to slice through the wind. One-Touch Design Philosophy: Every compartment and door must open with a single touch. Otherwise it doesn’t go on a Harley-Davidson® touring bike. One Touch Fuel Door: The fuel door takes a single touch, even with gloves on. Tour-Pak® Luggage Carrier: The Tour-Pak® luggage offers safe and secure storage for your gear. It opens with a single touch and can hold up to two full face helmets. Two-Up Touring Saddle: This stylish, sculpted saddle offers a deep bucket and narrow neck in order to provide plenty of comfort and relieve pressure so you can ride all day. 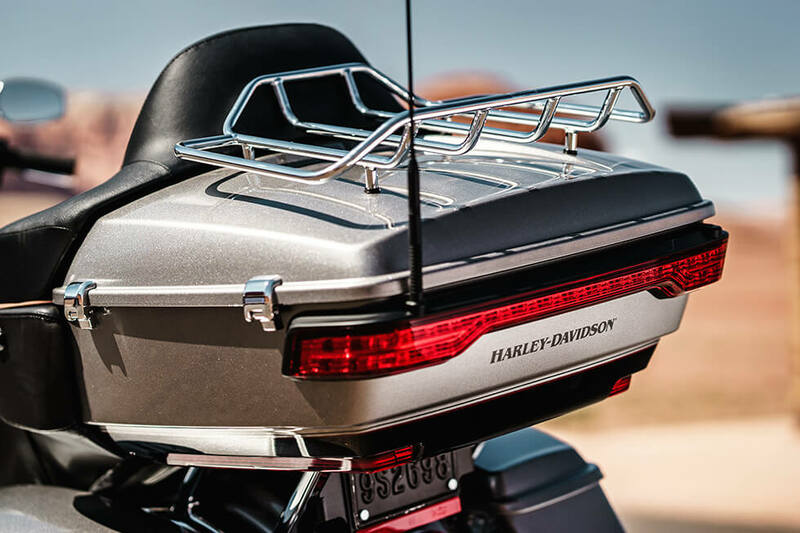 Full Length Footboards: In order to give you the flexibility to ride how you want, the Road Glide® Ultra gets full length footboards with comfortable rubber isolating foot pads. Standard Cruise Control: To help you cover more ground, you get standard cruise control. Your Road Glide® Ultra looks great in any situation, whether you’re just cruising around town or out on the open road. New 13.5-Inch Custom Windshield: This tall windshield allows you to avoid head buffeting winds and flying insects easily, a feature you’ll appreciate on the open roads around Lenexa. 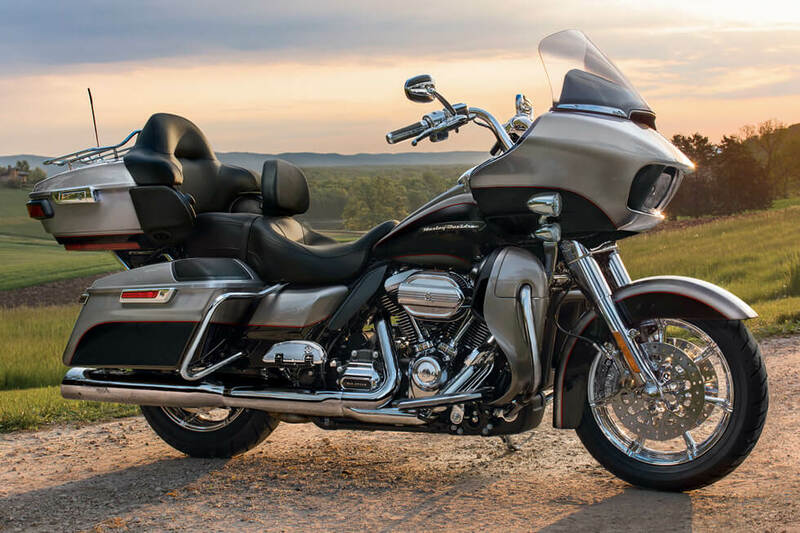 Fairing, Saddlebags and Front Fender: Premium styling provides a unified, smooth, seamless look, with paint matched fenders, saddlebags, fairing, tank, and more. 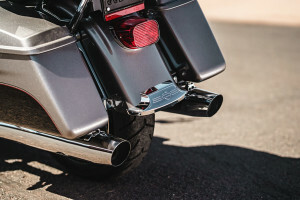 Classic Fuel Tank: The unmistakable Harley-Davidson® fuel tank gives you full custom badging and premium paint along with six gallons of fuel tank capacity. 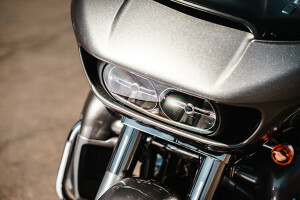 Combination Stop/Turn/Tail Lights: To keep the rear profile of the Road Glide® Ultra simple, you get three-in-one turn, stop, and tail lights. Impeller Cast Aluminum Wheels: With a classic cast aluminum pattern, these wheels provide lightweight performance and head turning style. 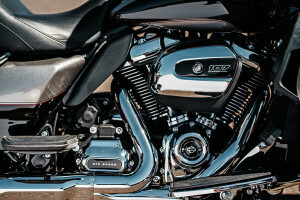 Pure Harley-Davidson® Styling: The new Milwaukee-EightTM offers iconic styling with classic custom badging, chrome air cleaner cover and rocker covers, and blacked out cylinders. Badging: The Road Glide® Ultra provides classic Harley-Davidson® badging in bold chrome so everybody knows what you’re riding.